Happy Friday everyone and thanks for taking the time to visit the Great Impressions Blog. Another summer weekend is almost upon us - so hope you have some fun plans. A day of creating would be lots of fun. Remember that our monthly animal challenge is in full swing right now. More details here. Hope you can play along. For my card today I used the beautiful doily stamp J101. I think it is such a feminine stamp and creates a feminine card. I did an emboss resist technique. The image is embossed and then I sponged blushing bride ink all around. The embossed image resists the color. I die cut a butterfly and added some ribbon and a bow to complete my card. This card is so easy to recreate and could be used for a birthday, anniversary or even a wedding. All it takes is adding a sentiment. I haven't decided how I will use this one yet so I left off a sentiment. But the center of the doily would be a great spot to add a sentiment. Or some other ideas would be to die cut a circle or even a pennant and stamp a sentiment and voila card ready to go!!! Hope you liked my sample for today. I will be back again next Friday. This is one of my favorite stamps Mary! So many things you can do with it. I love the soft look you created and that elegant butterfly! I've been looking at this stamp myself...great idea to emboss for color resist and so beautiful too. 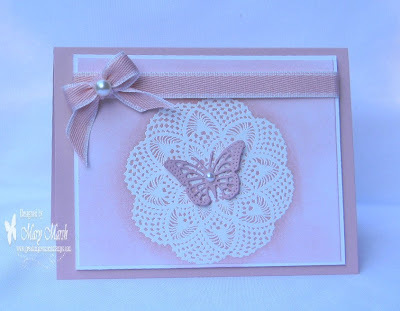 Love doilies...what a simply pretty card!